Kick panels offer a unique look & sound to your vehicle. If you want to get the most out of your speakers kick panels can help. 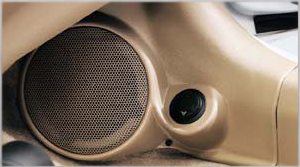 Factory speaker locations do not take into account many factors that are important for crystal clear car audio sound. With custom kick panels designed for your vehicle, you will get a perfect factory match, and crystal clear audio. Browse for you vehicle below, if we don't have it we also stock universal kick panels that you can customize to fit your vehicle.